Tune in tonight to John King, USA as we take you behind the numbers of the jobs report and what it means for you and your bottom line. NEW YORK (CNNMoney) - Businesses hired far fewer workers than expected in May, throwing into doubt the strength of the economic recovery. 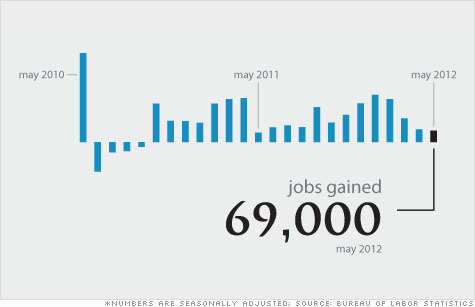 Only 69,000 jobs were added last month, the weakest growth in a year. The unemployment rate rose to 8.2%, as people rejoined the labor force. Economists surveyed by CNNMoney had expected to see employers add 150,000 jobs and the unemployment rate to remain at 8.1%. Revisions from previous months also showed the economy gained 49,000 fewer jobs in March and April than originally thought.